Orange...You Glad We Wrote this Color Primer? Spring has sprung, flowers are in bloom, and your wardrobe is just begging for a refresh. Our recommendation? Hit your closet with some orange! This bright hue lends itself to surprisingly easy-to-wear color combinations and outfit ideas. Who knew Mother Nature doubled as a style expert? What color goes with orange? Well, you’ve got a few options, actually! 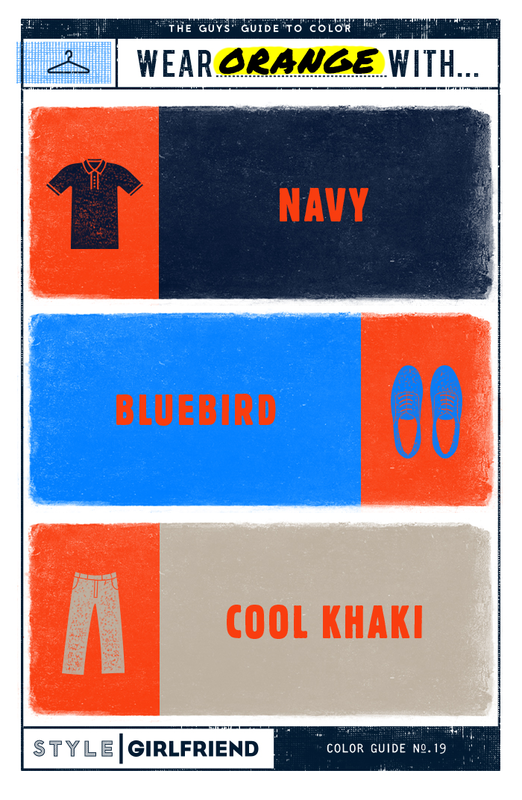 Orange goes great with navy, a brighter blue, and also khaki. That means, you can wear orange as the only bright color in an outfit otherwise anchored by neutrals. Or you can hit ’em with a one-two punch of orange and bright blue if you’re looking to take things up a notch. Orange also looks great against army green, like an army green twill jacket. This hue can pack a punch or make a softer statement, depending how you wear it. We love orange paired with pastel shades, mixed into prints and patterns, and all on its own with your everyday work and weekend basics. Read on to get the details about how to make this shade work, no matter where you’re headed. Consider wearing orange in small doses to work, from a printed pocket square to a rugby striped tie. On your own time, don’t be afraid to go bold, making orange the key color in your top or spring bottoms. Yes, you can wear the traditionally bright, citrusy shade that reminds you of its namesake fruit. But don’t be afraid to explore the color spectrum, from rust to a hi-vis hue. SG Says: Feeling shy? Pops of orange in your accessories is just enough to elevate your workplace game. Want to go a little farther? Try a button-down in a muted orange hue. SG Says: In the cold weather months, you could wear a burnt orange cardigan layered over a plaid sport shirt that also has a hint of the hue in it. Add a sport coat to make things a little more professional. SG Says: This would be another good outfit for a casual office, albeit for warmer weather. The mix of patterns in the jacket and dress shirt complement each other, rather than compete. SG Says: This is a great example of how to wear a big dose of orange without it feel like “too much.” With washed-out khaki joggers (a look we love, by the way!) and blue sneakers, the overall effect is cool, not comical. SG Says: Dare to have a little fun with orange in your off-duty wardrobe. 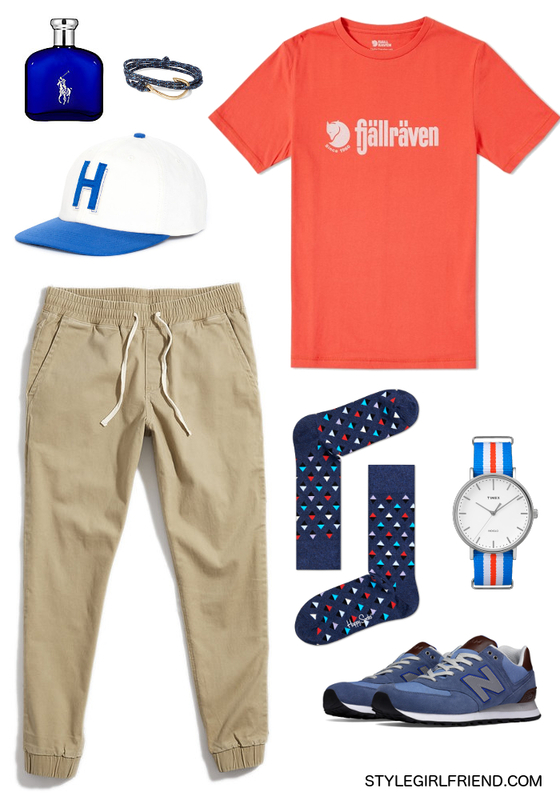 Paired with a turquoise blue, the citrus-y hues of the wallet and sneakers really stand out. Our Spring Style Guide was presented in partnership with Uniqlo USA. Thanks for supporting the brands that make Style Girlfriend possible! Ready to add some orange to your wardrobe rotation? If we’ve convinced you it’s time to level up your color game, but you dread the thought of shopping for new clothes…why not let Team SG shop for you? Let us rescue you from shopping fatigue and sartorial apathy. With our online personal shopping service, we can promise the kind of dedicated attention that will make you feel like the best, most stylish version of the awesome guy you already are! We’ll also help you figure out how to wear your new sweaters (and whatever else you need) with the things you already own. If you’re ready for a shopping plan that’ll save you time, energy, and your sanity, give us a shout.